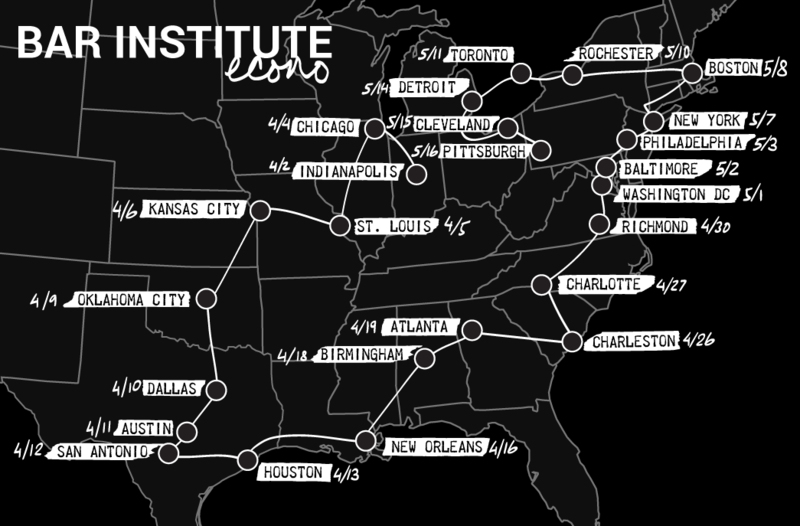 rBar Institute is hitting the road for a six week tour stopping in 25 cities in the US and Canada in Spring 2017! In each city, they will be hosting a one day Bar Institute session featuring 3-5 classes and a popup event, which will incorporate the information from the classes into service each night. They’ll be asking for only a $5 donation for admission to the classes and the drinks in the evening. All proceeds will benefit charity. Along the way, they've identified social justice issues that will serve as the centerpiece of the weekly focus for each region. This is so awesome! They will be in a bunch of mid size cities – many of which don’t have cocktail conferences very often, if ever. If you’ve never been to an event like this and the tour is coming near you…I hope you’ll go! In fact, we'll make a deal with you. Fill out the form here. We will randomly choose at least 2 people that fill out the form before April 2, 2017 and send you some swag, provided by Lush Life, (the parent company of Bar Institute). USA residents only please.